I think I just discovered something that is going to revolutionize my life. I love ham, grilled pork chops, pork ribs, grilled chicken........ I could go on and on. My favorite food group is definitely meat. I would give up any other food group (even grains, my sweet little carbs), before giving up meat. What goes deliciously with grilled pork and chicken? SWEET GLAZES. A lot of my favorite marinades, BBQ sauces, and glazes have some sort of sweet component such as orange juice, pineapple juice, brown sugar, or ketchup. Where am I going with this? Mint jelly with lamb. 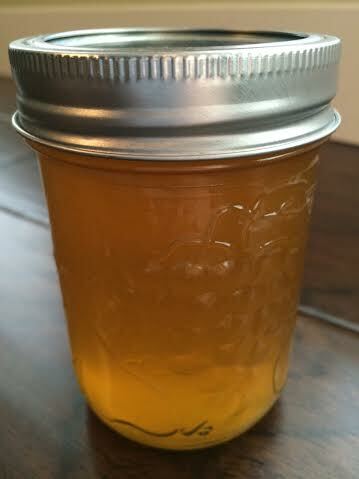 Apple jelly with pork roast. What about ham with PINEAPPLE JELLY? What about pork chops or chicken basted with PINEAPPLE JELLY in the last couple minutes of grilling? I'M SHOUTING ABOUT PINEAPPLE JELLY!!!! SHOUTING!!! I didn't even realize that pineapple jelly existed. I don't know why. There are tons of recipes out there for it. A lot of them call for fresh pineapple to be cut up really finely and drained through cheesecloth, which is usually what you do with berries after cooking them to render the juice. I happened to find one that just uses a carton of store bought pineapple juice. Yup. That's all. Juice, sugar, and pectin. I made it during a naptime and was thrilled with the results! I found the recipe via Pinterest, which lead me here. This recipe made 5 x 250 ml (1 cup) jars for me, and was so easy. Sterilize all jars, lids, rings and tools. 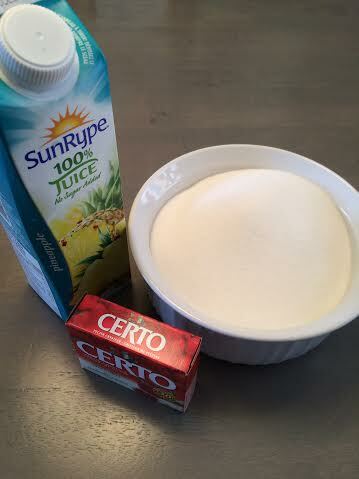 Combine juice and Certo in a large pot. Bring to a boil, stirring frequently, over medium-high heat. When it reaches a boil, stir in sugar. Return to a full, rolling boil (you shouldn't be able to stir it down), and continue boiling for 1 minute. Remove from heat. Skim any foam off the top and pour into warm jars, leaving approximately 1/4 inch headspace. Ensure the rim is free of any sticky liquid and top with lids and rings. Process in a boiling water bath for 15 minutes. Note: The original recipe adds 1 tsp of margarine or butter to reduce foaming. I don't find that this helps, so I omitted this. The original recipe also omits processing in a boiling water bath. I have also done this in the past, but I just like the peace of mind that comes with this extra step.